The heat wave that has melted the tri-state for the past week broke records in New York City and New Jersey Friday, hitting 104 degrees in Central Park and a sultry 108 in Newark. The scorching temps caused power outages throughout the area, along with some transit problems for evening rush hour commuters. The heat index was greater than 110 degrees in both New York City and Newark; 108 degrees is the hottest ever on record in New Jersey's largest city. The previous Central Park record for July 22 was 101 degrees, set in 1957. It's the seventh day of the scorching summer heat wave, and the heat is not expected to retreat until Sunday. "It's unbearable, you can't get away from it," said Chris Aufrero, who was working construction in the blazing sun. "No clouds, no shade, nothing. Just so hot." Commissioner Joe Bruno of the city's Office of Emergency Management urged New Yorkers on Friday to "conserve, conserve, conserve." "We are not anywhere out of the woods today, and we have another heavy day tomorrow," he said. 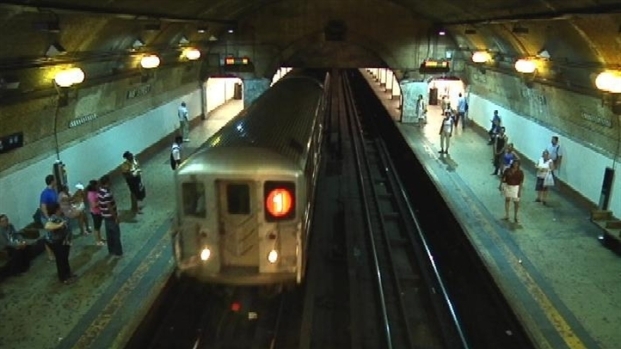 Catching a subway ride in this heat isn't only uncomfortable, it can be dangerous. NBCNewYork?s Demarco Morgan went underground to see just how hot it gets on the platform. A number of heat-related incidents were reported Friday. Passengers on Metro-North trains disabled by the heat spent 90 minutes in sweltering train cars until the trains could be moved to the next station. Three were later treated for heat exhaustion, the agency said. The disabled trains caused 35-40 minute delays during evening rush hour on the New York to New Haven line. Metro-North service on the westbound New Haven to Stamford line was suspended while the MTA used the tracks in place of the disrupted lines. Con Edison said that as of 10:30 p.m. Friday, electric service was out for 29,003 customers. Con Edison reduced voltage to nearly 100,000 households in some Manhattan and Staten Island neighborhoods because of electrical equipment problems. The precautionary move is taken to relieve stress on the system, and may not be noticeable to customers in those areas, officials said. Nearly all of New Jersey is under an excessive heat warning through Saturday evening. PSE&G said about 15,000 were without power Friday evening. There were scattered outages affecting about 12,041 people on Long Island, and the Long Island Power Authority urged customers to conserve power to avoid additional problems. Suffolk County Police reported the arrest of a woman who left her 1-year-old daughter unattended inside her 2011 Mercedes Benz at the Big H Shopping Center Friday. Police found the girl sweating, alone in the car, in direct sunlight. The girl was not injured and is back with her mother. John Miksad, senior vice president of Electric Operations for Con Ed, said the utility has extra crews and support personnel standing by. The utility is asking customers to set air-conditioners at 78 degrees or higher, turn off lights in empty rooms and put off running appliances until after 10 p.m.
New York City cooling centers are open. For center locations and hours, click hereor call 311. City swimming pools were to have extended hours til 8 p.m. on Friday and longer hours on the weekend as well, officials said. The National Weather Service urges area residents to take extra precautions when working or spending time outdoors. Reschedule strenuous activities to early morning or evening and be aware of the signs and symptoms of heat exhaustion and heat stroke. Wear light weight and loose fitting clothing when possible and drink plenty of water. Forecasters say a sea breeze might provide some relief at the beaches, but for the most part, there will be little relief before Sunday. Highs Saturday are expected to hit the mid 90s before dropping to the mid 80s on Sunday. Next week’s forecast looks more seasonable with highs in the low to mid 80s.